Publicity Stills of "Zodiac: The Race Begins"
The great Buddha gave the eminent Jade Emperor the task of ruling the celestial and mortal worlds. Although the Emperor has made the mortal world a fa?ade of peace and tranquillity, which was thriving and prosperous, men still did not have an awareness of time. With the absence of this facility, calamity was certain. To prevent this calamity, the Jade Emperor gave a celestial order. But deep in the dark swamps, the thousand year old tree spirit hacks a plan of her own. Determined to thwart the plans of her long time enemy, the Jade Emperor, she sets forth to prevent the success of the Race be impeding the 12 chosen ones. "Zodiac" has been generating much buzz in its publicity campaign - you will know from advertisements everywhere that this is being touted as the first ever 3-D animation feature produced locally. A promising battlecry, if any, but the seemingly bouyant exclamation gradually reads more like a pleading disclaimer as you're watching the movie. The age old tale of the Chinese Zodiac should be familiar to many, otherwise, the quick summary would have you know that it is the story of how twelve animals selected by the Heavenly Courts were put in a race that would determine the order in which they were arranged to represent the lunar years. The winner of the race would naturally represent the first year, so on and so forth, and the order would be repeated after every revolution of twelve years. It is no secret that the tiny mouse eventually wins the race by hitching a ride from the bull and outwitting the other animals, which leads to the neat finale that concludes with the moral of the day: "brain over brawn". 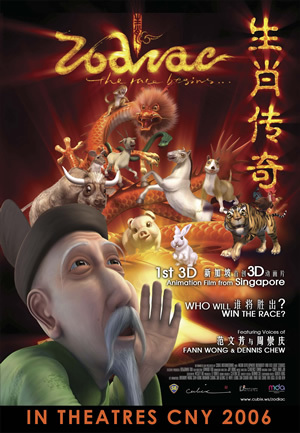 Taking into consideration that this is Singapore's maiden attempt at animation, the visuals in "Zodiac" are a good enough attempt. While concessions can be made in our expectations for the animation, it will be much harder to forgive the incoherence of the storyline. What "Zodiac" is lacking most desperately is a strong story; Chen Zhao Jing's original spin on the tale is simply not risky or quirky enough to pull off a feature length film. In handling twelve animals at once, the plot is exposed to clumsiness and the sketchy editing certainly does not help. Though there are moments of endearing whimsy such as when the monkey gets its infamous red derriere, these cheeky details come few and far between. In the end, it is clear that Fann Wong's star power is the only factor sustaining "Zodiac". It is disappointing when an actor (in this case, a mere voice) is bigger than the movie itself, but at least it's an astute production decision. An apt case of life imitating art, perhaps, for a movie that's about playing to your strengths and conquering the insurmountable.